The sudden urge to execute a closet makeover can hit at any time. Maybe you’re anticipating a change of season, or embarking on a new stage of life by moving or starting a new job. Maybe you’re inspired by an image of someone else’s organized wardrobe, or tired of wading through a messy closet every morning, wondering why you have so many clothes but nothing to wear. No matter the reason for it, giving your closet some attention will make your daily life simpler. It can be the perfect jump-start to organizing the rest of your home. 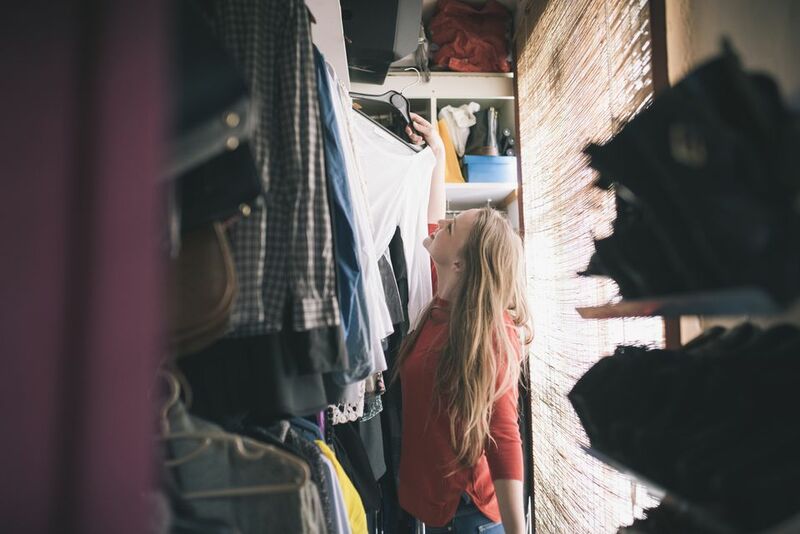 Here are some simple steps to help you through your closet makeover. Whether you're planning a major closet overhaul or a simple DIY makeover, your first step should always be to declutter your closet. There’s no point in wasting time organizing clothes you aren’t going to wear. So before you do anything else, clear out your entire closet and evaluate each item to separate what you love and want to keep from what you don’t like, don’t wear and don’t want. Questions to ask yourself while you sort your clothes into Yes and No piles: Does it fit me? If not, is it likely to fit me again soon? Does it suit my current lifestyle? Is it stained, damaged or dated? If so, can it be fixed or altered to make it wearable, and will I realistically do that soon? As you organize your wardrobe, keep in mind that the goal isn’t just to make the closet look tidy temporarily, but to make it more functional from now on. Imagine opening your closet every day and quickly selecting the appropriate outfit without feeling frustrated or distracted. One of the quickest ways to reach this goal is to limit the “working” area of your closet (i.e., the area not used for long-term storage) to clothes you can wear right now. For most people, this is easiest to achieve by rotating clothes seasonally, so that in summer, heavy sweaters and snow boots are stored out of sight, while sundresses and t-shirts are front and center. Before you put your newly reduced and seasonally selected clothes away, take a look at your empty closet. Does it need cleaning, painting or other maintenance? Maybe you want to repair a broken hinge, replace a light bulb or simply vacuum the floor. These little improvements are easier to put off when the closet is full, so tackle them now. If your closet is in good shape but looking a bit drab, there’s still a lot you can do to brighten up this part of the room and make getting dressed–as well as putting clean clothes away–a more pleasant experience. Tie a pretty scarf around the doorknob, add some sachets or cedar blocks to scent your clothes or fend off moths, get new matching hangers or add a full-length mirror. You could also add wallpaper or a new light fixture as was done in this closet makeover. Accessories like hangers, shelf dividers and hooks can take your closet from drab to dream, but you need to choose the right ones. Since your closet is already pretty busy-looking, filled with clothing, shoes, and handbags, choose neutral storage solutions like clear shelf dividers and simple wood hooks. As you decide where your clothing will “live,” imagine your closet as a boutique. If you were shopping for clothes, how would you like to see your options displayed? By color? By item type? In pre-selected outfits? What would reduce the time you spend searching for an item and speed up your process of grabbing exactly what you need? If you're weary and bleary-eyed in the morning and have a hard time putting together outfits for work, or if you get stage fright when you need to get dressed for a big event, try pinning your favorite outfit combinations to the inside door of your closet. This way you'll always have outfit inspo at eye-level when it's time to get dressed. This easy DIY could save you loads of time on your way to work or to a big event. Once you've sorted your clothing, shoes, and accessories into like-with-like categories, take the time to label any you have stored in baskets or bins. Storage containers like baskets and bins work best, or top shelves where you may not be able to see the contents of the shelf. Storage products can be a bit of a trap: they all seem useful in the store, but at home, they often end up making a closet feel even more cluttered. However, if you choose shelves, boxes, and hooks carefully, based on your specific closet needs, they can also be extremely helpful for sorting out your wardrobe. Before buying anything, take note of where your particular closet problems occur. For example, if you own a lot of scarves or belts, the right type of rack can keep them in place. Try a small revolving rack that hangs in your closet besides your clothes. These racks hold multiple belts or ties and because they spin around, you’ll never have to remove the rack to sort through your accessories. With unusually shaped items, like hats, you might have to get creative. Baseball caps can be strung on a cap rack that hangs over a closet door, but you might prefer to get broad-brimmed hats out of the closet altogether and keep them in pretty hat boxes or display them on wall pegs in your bedroom. Also be realistic about what you don’t need. If you mostly wear heels, a shoe bag that only holds flats will go unused. And some of the best closet storage solutions won’t be found in the closet section; one easy and efficient way to store handbags is to slip shower curtain hooks over your closet rod and hang bags up by their straps. Think about installing drawers. Not only can you use the drawers for storage, you can also use the top of the drawers to store small items like frequently-worn jewelry. Since the drawers form what is essentially a countertop inside your closet, be careful it doesn't become a dumping ground for clutter.